oil pressure gauge install DONE! Parts are gathering, now in the planning stage. The functional wiring of the gauge is pretty simple obviously, short of getting the wire ran from the sender up. Not worried about that. The question is, did any of you run a switched hot for the gauge light? Did you pull it from any particular wire? With all the immobilizer stuff, and being somewhat worried about tapping into the wrong wire for some reason, just wondered what you guys did. Seems like a real B!tch to get to the wiring cluster! Thanks! Last edited by Geof3; 03-16-2018 at 04:26 PM. there's a spare connector in behind the lower cubbies for a cell phone - you can get switched power off of it. Alternately, you can tap into the light for the console ashtray, which is what I did. I ran a wire along the underside of the dash using a fusetap from the fuse panel. Can't remember what fuse but I think it was A9 or C7. Oh, that might just be the ticket! Forgot about that little light. I don't particularly care if it dims or not. Still not sure where I am going to put this thing. Not a single flat surface anywhere in the dash... and I'm not yet ready to give up my center cubby. It is probably going to wind up under somewhere. Also, what do you guys think of this oil temp setup, running it off the bung on the other side? Think the sender might be too deep? Last edited by Geof3; 04-03-2018 at 09:27 AM. Got the oil pressure gauge installed today. 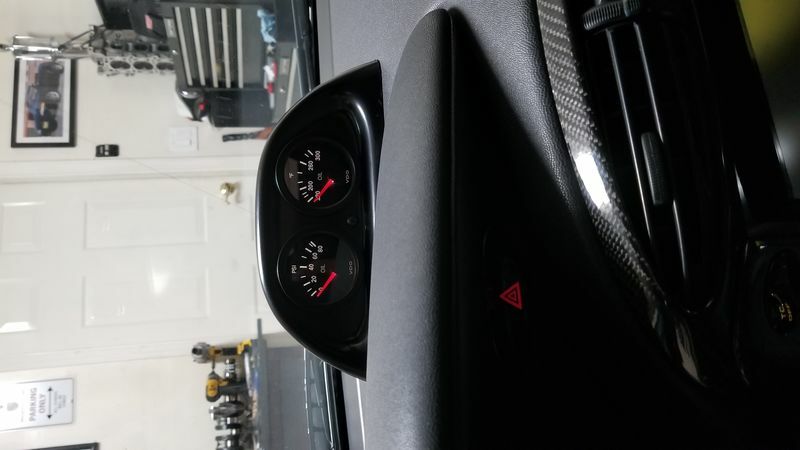 Went with a 996 sender and VDO gauge. 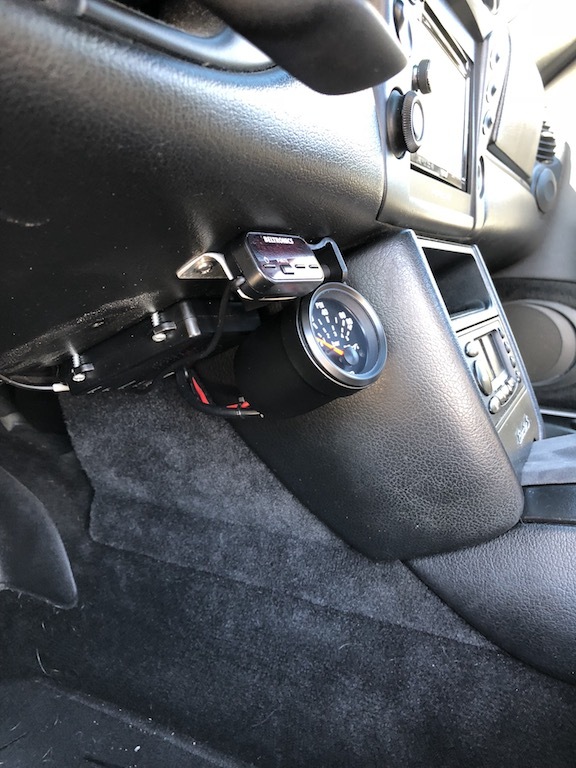 The mount is from Autometer. Location actually works quite well. Hot oil pressure at idle sits just above 1 bar. Overall, not a bad job, but a little fiddly here and there. Ran the sender wire down through the shift cable boot and up through the center console. Pulled hot and ground from the extra acc lead behind console. Pulled light from the center console light. Most of the time spent was wiring and getting everything to look tight. I never did the light since I don’t track at night. If I’m driving on the highway at night I don’t really worry about oil temp and pressure. Believe me, I almost didn’t do it. But everything was apart and I was there... so went ahead and did it. Nice! Did you have to take the dash out to get them to mount up/run wires? I'm most impressed with how he did the job hovering at a 90 degree angle? A DYI would be awesome! my anti gravity skills are legendary. In actuality, if you've ever done any car wiring work, this is straightforward. If you remove the cover of your sun sensor front and center of the dash, you'll see a hole for the wiring harness. Remove your radio and hvac system, get your hand back there, and start feeding the wire up from behind the lower console. Then starting from the top of the dash, drop a feed wire down until you see it by the center hvac vent. tape your sender wires to that feed wire and pull it back out of the dash. From there you can do the same for power and grounds. Then just wire up. I attached to dash with heavy duty velcro and a few spots of butyl just to keep it from vibrating. Nice job. Did you find that it impedes your vision/ distraction at all on the track? My first track day with this setup is tomorrow, so I'll let you know. 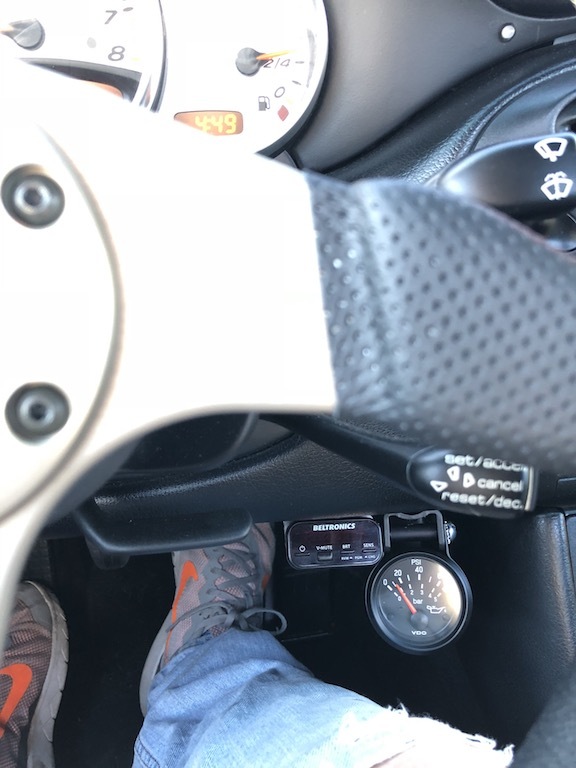 I moved it towards me on the dash (which slopes downwards) to improve visibility and went with black gauges to reduce distraction. I believe they will be more at-a-glance then a distraction, but will follow up after some time at lime rock. So gauges were not a distraction at all and line of sight was fine. It was cold out so oil temp only got to 235. Pressure seemed consistently low, but the gauge seems to move kinda slow so it was hard to tell. Any other vdo guys have this issue?